The traditional method of making cold coffee by pouring hot coffee over ice leads to a bitter and acidic drink so what’s the solution? Cold brew is a hassle-free brewing method that sidesteps this issue completely. If you’re looking for smooth and rich cold coffee that you can store in the fridge for up to 2 weeks, you’re in for a treat today. We’ve got fully 15 of the best coffee pots on the market, many of which allow you to make a range of drinks beyond cold brew. We’ll get straight down to business with our reviews then show you just how easy it is to make cold brew without any expensive machines or much effort at all beyond packing some patience while it steeps! Simplicity rules with the County Line Mason jar tailor-made for making enough cold brew concentrate to last you a week or so. If you don’t drink quite so much coffee, you can store this concentrate in the fridge for up to a fortnight so you’ve always got your cold brew on tap. 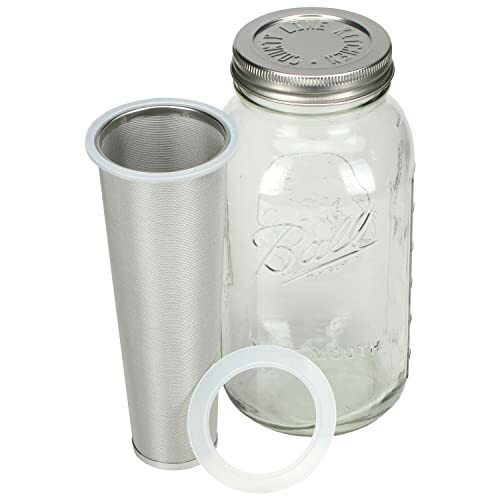 The combination of stainless steel filter and tight silicone seal on the lid gives you a drink with no rogue grinds floating around and a great lifespan due to the totally airtight nature of the vessel. The jar is free of BPA and plastics and it’s built to last as well as dishwasher-friendly so there’s no messy clean-up to contend with. The final kicker is that the County Line is very keenly priced too so you’ll have your investment back in no time by minimizing your trips to the coffee shop. Takeya have a hard-won reputation for producing top-tier coffee paraphernalia at a very keen price point. As with all their products, design is uppermost, but it’s not a case of form over function. As with all the best cold brew makers, making your concentrate couldn’t be easier – more on that down below. Free of BPA and any other contaminants, you’ll get the fine filter and airtight lid you need to make sure your concentrate stays fresh in the fridge for up to 2 weeks. If you need a new filter at any stage, these are available separately at very reasonable prices. For anyone on a tighter budget not wanting to sacrifice cold coffee at its finest, we can’t recommend the Takeya strongly enough. Stepping things up a notch in terms of pricing, the OXO Good Grips is nevertheless sterling value when you consider the performance. The rainmaker has tiny holes so your grounds will be showered evenly all over resulting in the optimum flavor with no effort on your part. 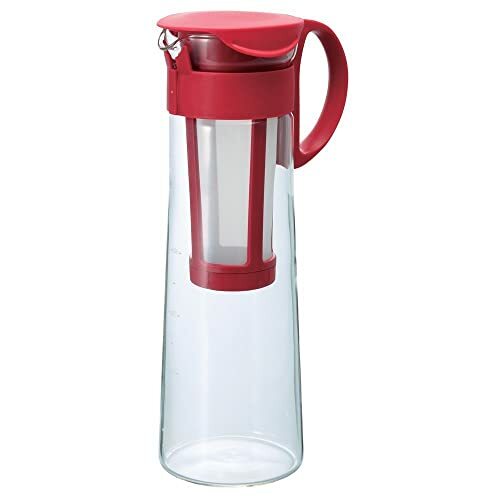 The carafe is crafted from borosilicate glass so it’s free of all contaminants and you can also easily see the markings to make your life even easier. 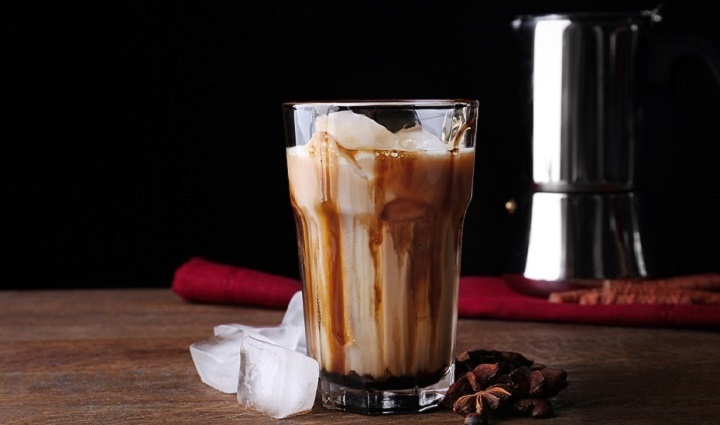 For an incredibly smooth cold coffee free of the bitterness and acidity that mars a classic iced drink, the OXO is the perfect weapon if you’ve got high standards and a more fluid budget. 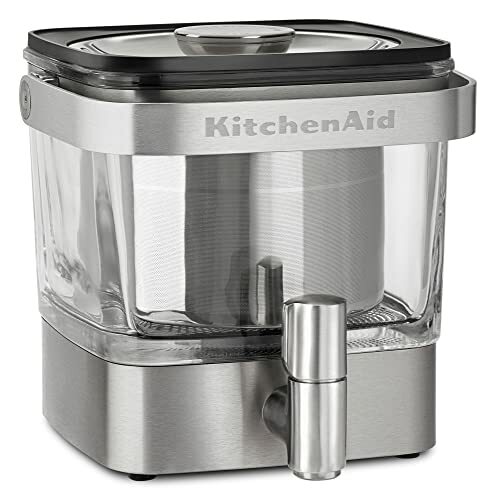 Although the KitchenAid cold brew machine is not exactly slimline, if you’re looking to brew up large batches, this is a rock-solid option good for a whopping 14 cold cups. Despite the size, there’s a nifty onboard dispenser so, once your concentrate is chilled in the refrigerator, you can pour your drinks without needing to remove it. This is a thoughtful touch rendering operation seamless. Glass and stainless steel combine to give you that combination of looks and performance along with a first-rate cold coffee every time. Not especially cheap, the KitchenAid is currently available at an aggressive discount. Act promptly and we can pretty much guarantee you won’t be disappointed. In the coffee business since 1964, Toddy specializes in producing coffee equipment for the connoisseur without charging the earth. 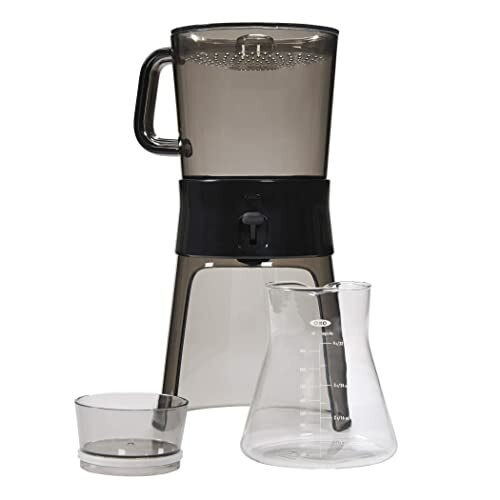 As with all the best cold brew coffee makers, using this system is a cinch. All you need to do is add water to your coarse grinds then, as you leave it overnight, the concentrate filters through giving you a rich essence with a fortnight’s lifespan. This system is highly versatile and you can just as easily brew up a batch of your favorite fresh tea along with hot or cold coffee. For cold brew, just use the concentrate delivered and you can keep it fresh when refrigerated for 2 weeks. As long as you don’t mind putting in the initial effort, it’s a method that provided near-instant coffee as long as you keep your eye on the level of concentrate you have remaining. This system from Toddy makes perfect sense if you want more than just a straight-up cold brew in one nifty appliance. 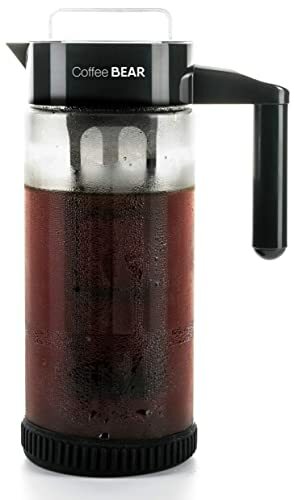 You might be wondering why we’ve got a French press in this collection of cold brew coffee makers but the classic Bodum Chambord will deliver a fine cool caffeine fix with minimum fanfare. Using a ratio of 1:4 or 1:5 beans to water, add your coarse grinds then fill slowly with cold, filtered water. Without stirring – and please resist the temptation – you then let the mixture sit for a full 12 hours at room temperature. This releases all the flavors and oils that would otherwise be agitated by heat. When it’s ready to pour, push the plunger down but only a few inches. Decant into a large, sealable container. You might consider using a secondary filter since those in a French press are less than ideal. The Bodum Chambord offers up a multi-purpose approach to cold brew well worth your time exploring. We’ve got a pot on the go right now about 2 hours from readiness! If you want a design-driven cold brew coffee maker that won’t stiff you in terms of end results, Hario serves up the highly attractive Mizudashi to meet your desires head-on. We road-tested the 1-liter pot, but if you drink a little less coffee, there’s a smaller 600-ml variant that’s even cheaper still. Cheap is not the word that will spring to mind when you use this hard-hitting cold brew maker, though. You’ll get the simplicity this brewing method is famous for along with a cool coffee that tastes far richer and far less acidic than a regulation hot coffee poured over ice. User-friendly in the extreme from spout and filter down to dishwasher-friendly build so why go through agony to make a cold brew when you can go Hario instead? 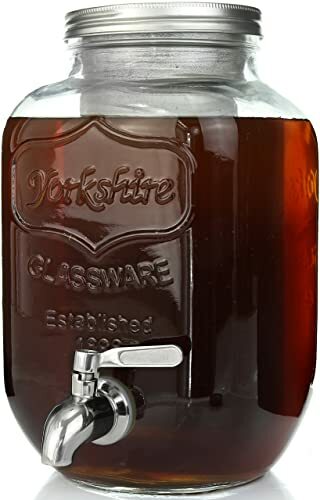 Made from borosilicate glass, this large-capacity cold brew pot needs handling with kid gloves, but it’s well worth lavishing care on it if you appreciate coffee at its finest. Coming in at a very competitive price-point, you can start enjoying smooth cool coffee with none of the taint of a standard iced alternative after as little as 12 hours steeping. Pouring and clean-up are as straightforward as making your coffee so if you want a gourmet caffeine fix in the morning without hitting the local chain, this might be the smartest investment you make all year. 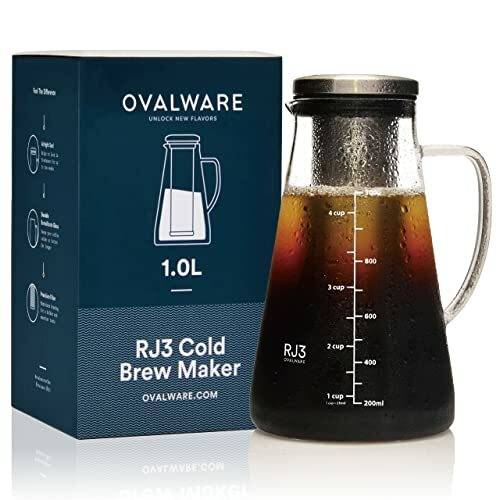 A no-nonsense cold brew carafe, this Ovalware allows you to brew up tea or other infusions alongside both hot and cold coffee so you get plenty of bang for your buck. While the manufacturer claims this glass is super-strong and we encountered no issues during testing, a few disgruntled users have complained about this coffee maker shattering. It’s always difficult to determine whether this was due to carelessness or build quality so make your own mind up but be aware of this reported snag. The other notable bugbear is a seal that could be tighter but what does the Ovalware do well? You’ll get versatility, a sleek aesthetic and the confidence of a refund option during the first 3 months of purchase. Roll all this together and we’d urge you to give this coffee maker a shot if you want the best of hot and cold coffee in a single compact unit. Next up is another back-to-basic Mason jar model from Simple Life Cycle. Making cold brew is as easy as the brand name suggests. The wide-mouthed container is perfect for tea, chai, and other infusions as well as accommodating freshly ground beans for hot or cold coffee. 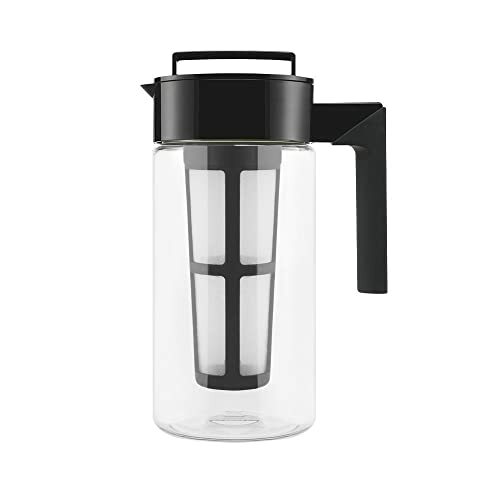 The sturdy glass construction keeps plastic and BPA out of the equation and ensures you get a taint-free coffee every time. 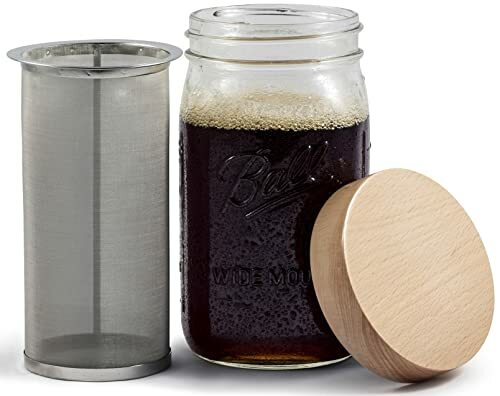 The lid is wooden but we should point out there is a metal insert which is always a weak point on Mason jars since it will rust in the long haul. This type of delivery system gives you a great deal of freedom. From hot or cold coffee to green tea and chai, imagination is your only limitation and you’ll only need one piece of kit for all your drinks so this works particularly well if space is at a premium in your kitchen. 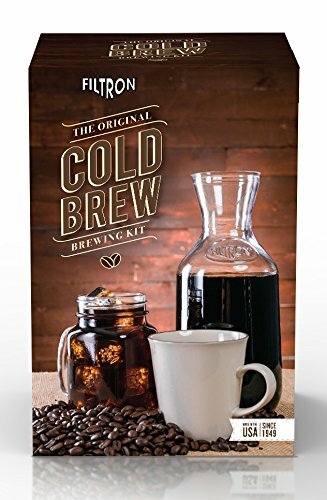 Despite the name, you’ll be able to create more than straight cold brew with this neat little kit from Filtron. Once you’ve got that delectable concentrate in place, you can easily deploy it for creamy lattes and cappuccinos as well as the cold coffee you bought it for. This model does call for paper filters but you can pick these up in bulk at a pretty reasonable price. Just make sure you consider this in advance to avoid annoyance at needing to pay for them on an ongoing basis. Capacity is impressive and you’ll be able to brew up enough of your favorite drinks to keep the whole family darting in and out of the fridge without needing to constantly replenish supplies. 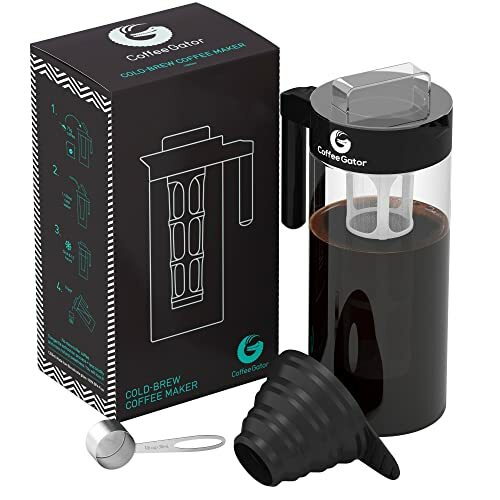 Replacing heat with an extended brewing time, this cold brew kit from the legendary Coffee Gator comes with everything you need included down to a scoop and funnel. As long as you don’t mind waiting for the first batch to steep overnight, once you’re up and running you can store your concentrate in the fridge so this is not a labor-intensive brewing method. As with all cold brew, you’ll eliminate the bitterness that mars iced coffee when it’s brewed hot then poured over ice. Design-wise, the Coffee Gator makes a real statement while you get a hard-hitting kit boasting everything down to a scoop and loading funnel. Although it weighs less than 2 pounds and boats a very small footprint, capacity is impressive at 47oz. If we’re honest, the only real drawback of cold brew is that initial overnight wait. Cuisinart identified this problem and combated it perfectly with this electric model capable of doling out your brew in as little as a half-hour. You’ll get 7 cups from this coffee maker so it should be fit for most purposes. You can monitor proceedings through the transparent chamber and everything disassembles so you can pop it in the dishwasher or clean it by hand according to preference. The indicator light shows you at a glance when your coffee is ready to roll and you can slide the carafe into the fridge if you want that concentrate on tap. Resembling something from a hi-tech science lab, this glass tower is a thing of real beauty but how does it deliver on the coffee front? Admirably. The drip system in place might take up to 4 hours but it’s well worth the wait. Also, compared to the overnight hiatus waiting for standard cold brew, it’s a positive time-saver. 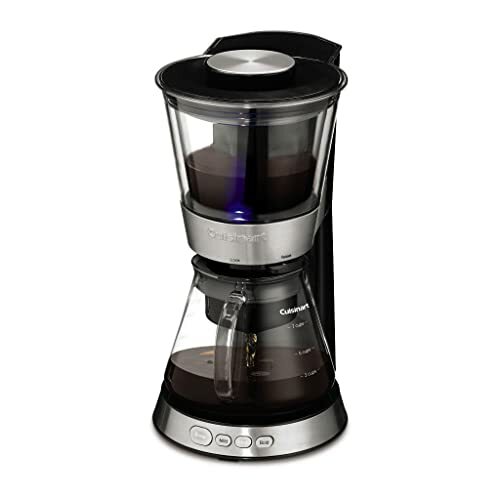 The borosilicate glass means you won’t get any smells or chemicals absorbed into the coffee maker. This functional business-end is surrounded by elegant wood so you’ll have a conversation piece in the kitchen not just a run-of-the-mill coffee maker. 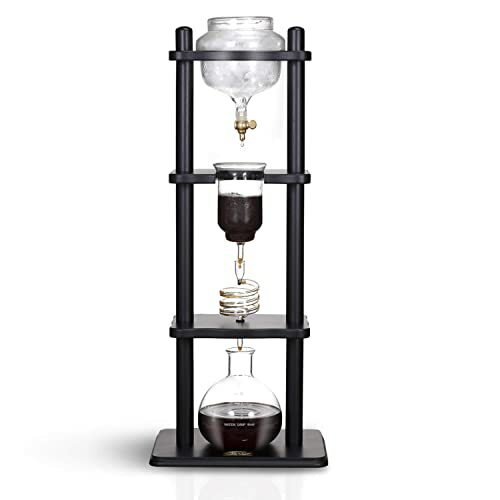 Make no mistake about it, this cold brew tower is a pricey piece of kit, but if you won’t settle for anything but the best, we can find nothing bad about this Yama beauty other than that ruthless price tag. We’ll round out with another Mason jar-style cold brew maker with a twist. For sheer speed, this Willow and Everett smashes all the other models we reviewed out of the park. Forget overnight steeping, you’ll have your favorite cold brew in minutes without any negative impact on the end result. Another touch of sheer convenience is the integrated spout from which the cold brew on tap name is derived. This jar is also dishwasher safe and the filters are a breeze to clean so for a stress-free approach to cold brewing, this is one of the most innovative options at your disposal. We recently took a look at which coarseness levels respond best to each brewing method so today we’ll focus purely on the job at hand with cold brew. If you don’t have a coffee grinder, check out a broad cross-section of the very finest models right here. With your grinder in place, what about the consistency? Luckily, you just need to stick with a coarse grind just like you’d use in your French press. Indeed, you can use a press for cold brew as we outlined above with the Bodum. Using a coarse grind helps the filtration process and will also ensure you don’t get the bitterness that spoils cold coffee when it’s poured hot over ice. So, to avoid over-extraction and to keep things tasting the way they should do, opt for a coarse grind every time. Next up, we’ll highlight the chief benefits of the cold brew method so you can see at a glance why this technique is so effective. With those advantages of cold brew outlined, how do you make a cup to get the party started? The added bonus is that you can store this concentrate in the fridge for up to 2 weeks! We hope you’ve found at least one coffee maker here today to tempt you over to the merits of cold brew coffee. Many people are put off this method because of the prolonged initial waiting time. All we’d say in response to that is that you only need to do this once to ensure a supply of concentrate. If you’re organized and brew up more in advance, you can eliminate this waiting around since you’ll already have some in hand. We also looked at several coffee makers capable of delivering cold brew without this overnight delay so don’t let this issue stop you. 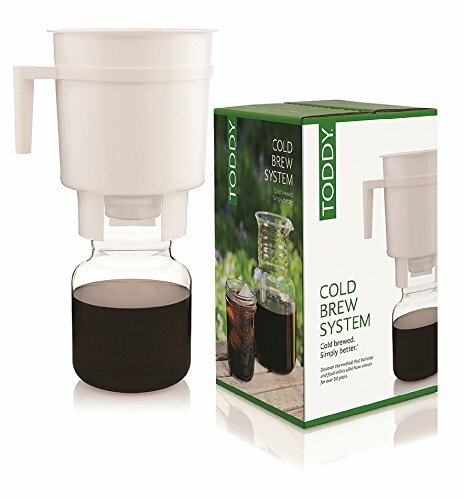 If you relish a cold coffee on a hot day but don’t want that bitterness and dilution you get from pouring it hot over ice cubes, there’s simply no substitute for cold brewing. 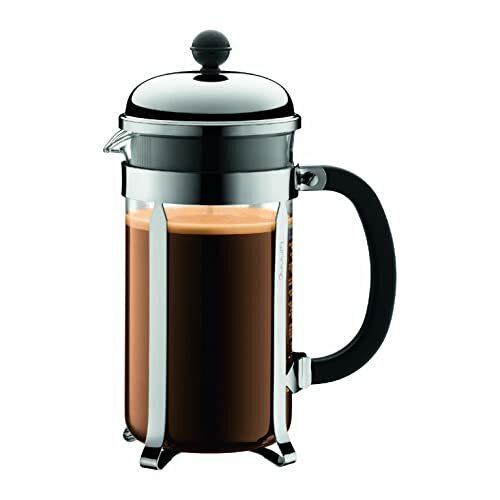 You don’t even need a dedicated coffee maker if you already have a French press in the house either so why not try that method out first and see how it tickles your taste buds? Come back soon as we’re just finishing up testing some pour-over coffee makers. As always, we’ve got something for everyone here, from beginners to true coffee fiends!